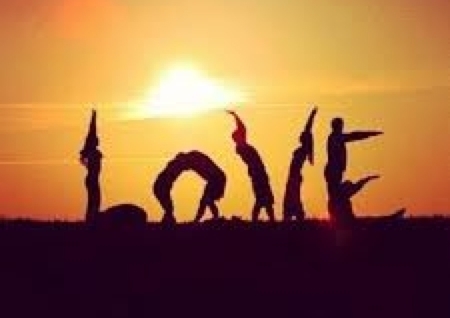 Yoga in the time of Love…. Or, Love in the time of Yoga!….. I have my fair share of cynicism around Valentine’s Day, and yet, a part of me is gleeful that we have a holiday that celebrates the loving heart—cards, candy, flowers and all. I think anything that gives us an excuse to ruminate on the nature and taste of love between not just lovers, but all people, can’t be all bad. For my own part, I have been meditating and marveling on the nature and power of love, and of sorrow, and the love of letting go. I have a dear friend who is dying, suddenly, painfully, and quickly. Amie is not expected to live much longer, and I would like to share a few thoughts and insights from her brother, and friends, made powerfully clear to those of us witnessing her process of letting go and dying. Hold your loved ones close. Love big and love unreservedly. Fling your love across the universe. And remember that sometimes loving well means letting go. May we all have the courage and depth of love to release with arms wide open.